Thanks to Roy Ascott, Head of Fine Art, I was able to take over the academic staff room for a series of weekly performances I did in my first term at Newport. The room was on the ground floor, next to the canteen, and my performances were actually quite well attended by a mix of students and lecturers from different parts of the art college. In some performances, such as After Avebury, there was an improvised participatory element. The room was blacked out and the audience sat on the floor around a circle of light created lit by a ring of candles. People accompanied a music recording using the rocks and sticks I’d provided for them while I leapt across the circle through the flames. I’d composed the music on my guitar after returning from a trip to Avebury a few days earlier - Roy took us off on a coach for the day to his old stomping ground, across the Severn Bridge and along the A4 to Silbury Hill, and then on to Avebury, where I did some dowsing around the perimeter of the megalith ring, followed by a tarot reading. Faced with a layer of chalk, and nowadays covered in grass, Silbury Hill is the tallest prehistoric mound in northern Europe. Construction began around 2400 BCE when the first Stonehenge was being built in stone. Silbury Hill is an integral part of a designed landscape that includes the Avebury stone circles and henge, Stonehenge, Marlborough Mound and West Kennet Long Barrow. 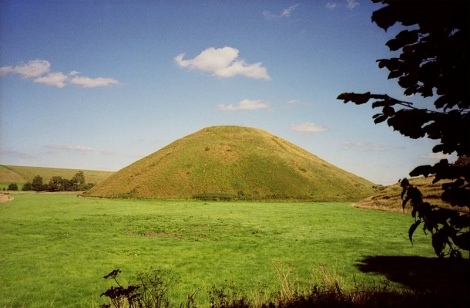 Silbury Hill is sited on a significant leyline that links Avebury church to Stonehenge. It is not known why the mound was constructed or what meaning it had for the society which built it.